Obverse: Large crowned profile of Henry VII, right. Text around HENRIC VII DI GRA REX ANGL Z FR. Reverse: Royal shield, fleur de lys in first and fourth quarters, lions in second and third quarters, over long cross with saltire in forks. Text around POSVI DEVM ADIVTOE MEV (I have made God my helper). 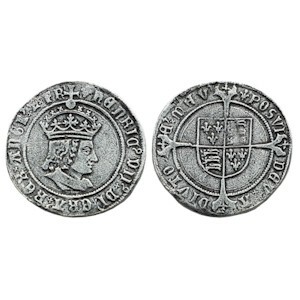 History: In the opening years of the 16th century the remarkable and fine profile portrait of the King replaced the representational image of a monarch that had served on coinage for the past couple of centuries. At this time a new coin the Testoon valued at 12 pence was also introduced, but was only struck for two years. This was the work of Alexander Brugsal, a German appointed as engraver to the mint in 1494. The obverse legend was also expanded to give the King's name as HENRIC VII, a practice continued by his successors.